In 2016, the Music Industry had its best year in nearly two decades and 2017 finished strong. The reason is that “The Industry” (Sony, Warner, Universal) owns one of the most compelling products in the world, the back catalog of music we’ve all grown up with and love. If you work in music it’s a good time to be optimistic, but not comfortable. Music is uniquely positioned compared to other types of content because of it’s replay value. How valuable is written news from yesterday, let alone a few years ago? People want to watch their favorite movies a handful of times a year at most. On the flip side, people want to listen to their favorite songs thousands of times for the rest of their lives. Ownership of this intellectual property matters. People forget that “The Product” is the entire experience a user has, not just the user interface. Airbnb’s product is users staying in their homes, not just booking on their app. Amazon’s product is the unlimited selection and fast shipping, not their confusing homepage. By extension, Spotify’s product is more so the music it contains than it is the beautiful user interface. But while streaming companies battle it out to acquire users and try to figure out how to properly get artists paid for streams, what comes next? Despite what bankers think, if the industry is going to reach its potential in the digital age, they need to continue to rethink their business. 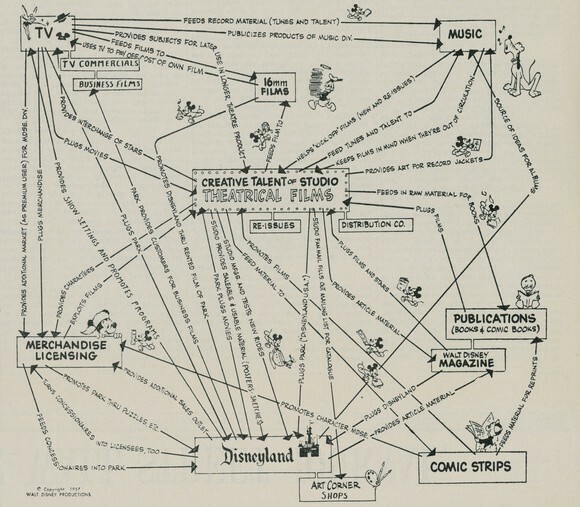 The above sketch was done by Walt Disney in 1957, mapping out Disney’s corporate strategy. Like music, the entire strategy is predicated on the “creative talent” at its heart, spanning to multiple channels and fan touch points from there. Despite what many think, streaming needs to be viewed for what it is, just one channel. It’s a single piece of a larger strategy for the industry, not the end-game. There is some misguided hope that these streaming incumbents will be able to facilitate the next wave of growth in areas beyond streaming because of their “data”. Pandora should have been able to leverage “all of their data” to sell tickets. Instead, they took a massive loss on Ticketfly after a failed attempt. Spotify is selling the same story about their future growth prospects. Despite certain “data advantages” these companies may have, the most transformative companies are born by opening new data streams. Google won by opening up a new, previously untapped data stream: links on the internet. Waze won by opening up a new, previously untapped data stream: user-generated GPS data (eventually leading to a Google acquisition). The next great data stream and opportunity for the industry appears to be centered around fan buying habits and pricing. iTunes trained us that all music is worth the same, something streaming services have now extended. It may be too late to change this in the case of digital music, but it isn’t the case for tours, merchandise, and areas that actually generate the lion’s share of the money for artists. So how do you price the inherent scarcity of tickets, merchandise, and other non-commodity items? It’s something other industries have figured out and it’s time for the music industry to join the party. Every Uber you ride in, every Amazon purchase you make, and every flight booked comes with a dynamic price tag, meaning the prices change in real-time based on demand. The goal of dynamic pricing is to find the right balance between supply and demand. It’s how markets have always worked. Dynamic pricing is already happening in the music industry, except that it’s happening in the secondary markets where the creators don’t see any of the upside. 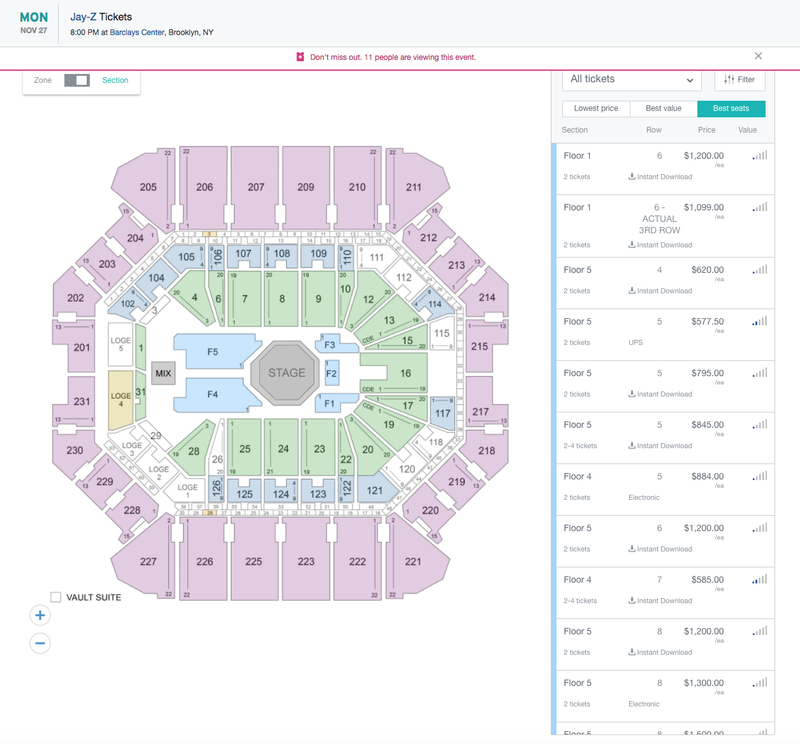 A quick search for Jay-Z tickets in Brooklyn reveals prices starting at $91 and going well past $2K for access to the show, many of the same tickets being priced differently. Identical pieces of Justin Bieber merchandise are selling for wildly different prices across the web as you read this. The gut reaction to dynamic pricing is often a negative one because, in many cases, it means prices going up. But in cases where demand is low, it means the price will actually drop. When Kanye tickets go on sale, the price will rise to match the insane demand (and maybe put some more money in his pocket). For the “40% of concert tickets that go unsold” every year, prices drop to increase sales. The fact that dynamic pricing has gotten a bad rep is surprising because the idea of a “fixed price tag” is actually a new invention in human history. “Fixed prices” made their first appearance about 150 years ago, while dynamic pricing has actually been the norm for the majority of human history. We’re rapidly moving back to a world of more fluid pricing. The inability to match the price of products, like tickets and merch, to market demand has resulted in a system for fans based on one thing: luck. When Drake announces a tour, it’s a complete crap shoot if you can get an opportunity to buy tickets upon release. Bots are quicker than you. If you’re lucky enough to hit refresh at the right time, maybe you can get a ticket. More likely, you end up on StubHub, where tickets are already being dynamically priced. The problem is, this pricing is happening in a largely arbitrary way and the money is going into the pockets of miscellaneous ticket brokers, not the artist you want to support. Now imagine an alternative system where you could access what you want, when it first goes on sale, passing money directly to the creators. The reality is that price is probably the best indicator to allow an individual to signal they want something more than someone else. You are presented a price for Drake tickets, based on the demand at that moment. You can decide if that price is worth it for you and purchase the tickets. Or you can wait to see if the price drops, knowing full well the ticket may sell out. The point is, you have a decision to make, which is not the case in the current system. People value things differently, at different times, and price allows them to signal that. 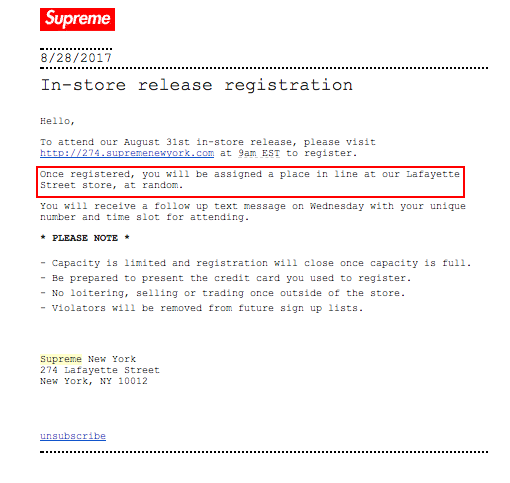 An email I got from Supreme about their luck based system. It’s not just ticketing where access to in-demand products is based on luck. Supreme, who sells some of the most coveted products in the world, decides who gets to buy their products “at random”. This made sense in 1994 when the first Supreme store opened because there were no other options. But those days are over. I’m sure there is obvious concern about a “brand degrading” experience, but Disney uses dynamic pricing and I’m hard-pressed to find a more time-tested brand then them. Although Taylor Swift is making an attempt to remove the bots from the ticketing equation, the reality is that her system is still based on luck. If you buy a bunch of stuff you may be able to get access to a ticket. It’s like putting a band-aid on a broken arm. There is also recent talk of an auction model for tickets. This is probably a better system than what we have right now, but consumer behavior clearly points to the fact that we don’t like auctions, we like convenience and certainty. So the question actually isn’t dynamic pricing vs. fixed pricing, it’s luck vs. choice. It also isn’t about “squeezing as much money from people as possible”, it’s about allowing the market to properly price items like we do with stocks and any other range of goods and services. It’s no secret that artists are the best brand managers in the world. Because of this, the primary reason dynamic pricing hasn’t been more widely embraced is because of the concern customers won’t like it. “It’s not good for the brand”. This fear seems to be over hyped though. The company that probably has the best data in the world about dynamic pricing is Uber, which is why they gave a team of prestigious economists access to their data to do a study on consumer surplus and dynamic pricing. What they found is that Uber is, on average, actually under-charging customers. Despite some early negative press for dynamic pricing, people are more price insensitive than expected and it turns out it was mostly just the press sensationalizing outrage. We prefer the certainty of a ride with Uber over the randomness of a ride with a taxi, even if the price is higher. To be fair, Uber has a massive brand problem right now, but not due to dynamic pricing. Access to the moments and products that shape our lives and shift our culture should not be left to luck. More importantly, those who are creating these moments should be participating in the upside of their art and intellectual property. Few things connect with people on a more personal, identity creating way than music. Every artist, manager, and VP would do better by leveraging technology to help them price their “creative talent” as opposed to playing the guessing game, which happens today. Matching price to demand is a key to any strategy in 2018 and beyond, whether it’s direct to consumer or through established channels. It may sound counterintuitive, but embracing dynamic pricing would create a better experience across a variety of touch points with fans while enabling creative industries to continue to grow. In the end, dynamic pricing works best for things that have a fixed supply and a base level of demand. I can’t think of anything with a more fixed supply than time and more in demand than cultural products like music and fashion.